I’m known for my florid, almost purple prose and lengthy, albeit humorous introductions. No time for that today. I’m leaving for the vasty wilderness and a weekend-long Internet blackout, and I have to get this one in the can before I depart for the great unknown. So, please pardon the upcoming abrupt transition. Industry sales are dropping precipitously, landmark stores are closing their doors, Marvel Comics is melting down in front of us (I mean that in a strictly “the nuclear pile has burned through the containment structure and is scorching its way towards the planet’s core” sense), and even the valiant efforts of (nearly) the entire DC staff hasn’t halted the collapse (or even slowed it down appreciably). This is heartbreaking. And it all starts with Marvel. YouTube comic reviewer (and open shitlord—I mean he talks like a /pol-ack, listens to Gavin McInnes, and refers to SJWs Always Lie constantly for crying out loud) “Diversity & Comics” released an excellent trio of videos illustrating the sharp decline of the comics industry, why it’s happening, and what to do about it. How bad is it? It’s “INDIES BEATING MARVEL” bad. It’s “Tiny print run indie comics sprinting ahead of the industry leader” bad. It’s “Marvel so dead ‘Rick and Morty’ comic books are whuppin’ they butts” bad. That’s bad. Sales are dropping, they’re dropping hard and fast, and the industry is rapidly moving towards the Brick-and-Mortar Apocalypse at Pulp Speed Seven. The explanation, as always, goes back to infiltration by people who hate comics, but nonetheless want to hijack them for their own purposes. Tradpub (the major publishing houses you’re familiar with, like Random House) is bleeding out in large part due to the familiar antics. Fortunately Indie publishing is challenging their dominance whilst also undermining their business model. Video games? Well, that one’s up in the air right now. Recent events at Google and other leading software companies, as well as the content and tenor of presentations at the last E3 and Gamescom, have me worried. What D&C is talking about is, in effect, a Pulp Revolution for the comics industry. The Pulp Revolution is a bunch of guys who love the classics of Fantasy & Science Fiction, classics which have been buried and forgotten. (Comic fans, imagine if Superman, Batman, Alan Scott, and EVERY OTHER CHARACTER of the Golden Age had all been deliberately forgotten and buried for seventy years, further imagine that few modern comics fans had ever heard of them and fewer still had ever read them. That’s the state of modern F&SF.) Pulp Revolutionaries want to take the Pulp spirit—the excitement, entertainment, and VITALITY of the Pulps—and make new works with it. That’s what comics needs: a group of people, passionate fans of superhero comics, to pick up the torch dropped by Marvel. Comics need an indie revolution. The medium needs its own Pulp Revolution. It needs people who love superhero comics to start making their own. I’d love to see hungry and highly motivated writers and artists make their own great comics, and surpass or even supplant Marvel. Now, if you’ve been following D&C for the last couple of weeks, you’ve seen him slowly moving towards starting his own comics company, whether he realized it or not at the time. It makes sense. He knows the industry and the medium, knows the people in the industry, and knows the mechanics behind making comics. And, even though his recent original comic (Jawbreakers) was savaged on release, he’s taking the criticism onboard, learning from it, and starting over. He’s upping his game. I have no idea if Diversity & Comics is capable of succeeding as a writer of comics. But he seems knowledgeable and skilled enough to, at the very least, become the EiC and publisher of a new comics company, an indie competitor to Marvel, and thus help others succeed at making comics. Which, given Marvel’s current sales, means this entirely hypothetical (but apparently aborning) company could begin beating Marvel at its own game. Marvel’s rapid decline into irrelevance has opened the door for some young upstart rival to do to them, what they once did to DC. And that rival could be D&C. Or if it isn’t, it could be someone else. Of course it won’t be easy, but it is possible. And at this point, it’d be cosmic justice. NOTE: Some factual errors that crept into this post have been corrected based on feedback from Diversity & Comics. D&C is solid and very perspicacious. An ex-Marine with a wife and kids. He remembers when comics were truly good, month after month. Being a lifelong Marvelite who hasn’t bought a Marvel comic in years, I would hope that there would be some way to completely reboot the company…but that is probably a foolish dream. The alternative is an indie company writing in the spirit we seem to have lost somewhere in the ’90s. The die was cast for Marvel in 1968 — that’s when it began to die, not in the 1990s — it was already in full zombification by that point. Forget rebooting Marvel, DC, Valiant, etc. Build your own brand; build your own characters and stories. Remember what Marvel *was* in 1961-1968, and strive for that level of FUN. That, plus hard work, will win you an audience. Stan Lee didn’t know what kind of fire he was playing with when he started trying to cater more to the college age readers later in his career. When the second wave of writers/editors came to Marvel in the 70s, they started writing topical stuff more and more, so now all these idiots we have writing crap today have a precedent they can cite to justify their antics. “How dare you criticize my story! Steve Englehart made Nixon the leader of the Secret Empire! 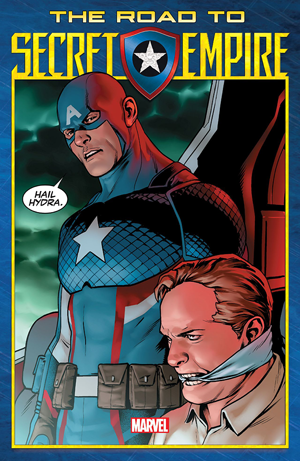 Marvel has always had left-wing politics!! !” Nevermind that most of those political stories have aged poorly. Steve Ditko left over the shift — he didn’t want to take Peter Parker into college — he saw Parker as blue collar. Kirby left as the shift happened; got no respect (no original art back) and migrated to DC. Stan lost control of the books as Roy Thomas came on to help with scripting. Great writer, but that meant Stan lost the bead with where the books as a whole were going. 1968-1974. RIP Silver Age of Marvel. 1975-1982: Bronze Age Marvel — re-animation of the X-Men and depreciation of all else non-Mutant. Iron Age Marvel: 1990s along with brief burst of B&W independent comics boom. Ended when Diamond became sole Marvel distributor. He’s also a big fan of John Carter and the old pulp style so he definitely has the best mindset for a revolution. Comics came from the pulps after all. More people saw that video than read Hulk. D&C points that out all the time. The audience is out there. This is how weak and pathetic the SJW “case” is — the audience just doesn’t have anything to buy at this time but the trash Marvel and others are pushing. Go and build it; they will come. Are we still clinging to the delusion that DC is not just as bad as Marvel?… They’re merely five feet behind the deranged ideologue curve, and arguably ahead in the lowest-common-denominator department. D&C isn’t DC. It’s Diversity & Comics. No, DC isn’t as bad. They WERE in lockstep with Marvel, but pulled back from Marvel-level of deranged-ideologue. Not fully, but significantly. Chuck Dixon of previous Batman, etc, fame, and Clinton Cash comicbook fame, is now back writing at DC. He would never be hired by SJW-Marvel again. BUT, as D&C has pointed out, DC is barely even in the copilot’s seat, if that, in the nose-diving comics industry. Stores are closing because they depend on Marvel sales, which have tanked too fast. When someone gives up on Marvel, they MAY give up on comics entirely, but when your local store closes, you are far less likely to buy as many of any title from any publisher. There’s even a believable rumor going around that Disney is highly displeased and has demanded serious changes, a first since they were bought. But the rumored changes are definitely far too-little, too-late. Of course, DC isn’t alt-Right, so some may think they are just as bad as Marvel. A few titles are, Wonder Woman being a candidate for the worst. Thanks for the link, DW! it’s your boi Zack lol. This is why I await that Alt-Hero project Vox Day talks about now and again with some eagerness. Yeah, D&C seems to be looking for an apolitical comic source, but that’ll probably have to wait a generation…if Team First Ammendment wins the current round of political fighting. Until then, I’m putting my money on the alt-hero thoroughbred over the SJW nags. diversity & comics slams jews constantly? wow, I didn’t know that. I’ve watched a lot of his videos and haven’t heard him do that yet. Up your game, troll. Looking like you’re way to short for this ride. no need to go critical Solar best to need feed the trolls. Can I relativize a bit. Perhaps the English language comics are dying. The Europeans seem healthier. There’s less politicization antics and there are more publishers. So if you’re 7nhappy with the Belgian comics you can read the French or Swiss French. Spanish seems smaller as the major publishers are Norma comics and one other I can’t remember but they don’t alienate their customer. It’s a real pity that the main media can’t pick up that Marvel’s SJW staff is destroying Billions of Dollars of Disney’s Marvel Assets. Basically, Alonso Axle and his staff helped destroy the Spider-Man audience base and that will account for Homecoming being short by $100 in revenues. Disney does not care about Social Justice Warriors; Disney DOES care about the fact that all of their assets are being destroyed by a bunch of second rate $400 per week editors who want to preach, preach, preach and can’t sell, sell, sell. Note, I missed putting in Homecoming being short by $100 Million in revenue. Disney does care about a chunk of a billion dollars. I’m not convinced that Disney is quite as sharp as that. They seem pretty SJW-flavored these days, increasingly so. I keep *hoping* they look at the bottom line instead of riding political hobby horses, but it doesn’t seem to be happening. Still, too little, too late, if true. Author of the rumors claims “replacing all the white guys” wasn’t planned. The entire tenor is that its all a cluster-f*** with egos and personal-fiefdoms and sales-gimmicks, and NO central architect guiding anything. Big plans by some get derailed by a sales-gimmick by someone else. I’ve been disappointed that Disney has been so hands off. When they bought Marvel, I figured the best thing about the deal for the comics side was that Disney was pretty good about brand protection and would keep the kids from taking too many liberties (and the comics were already crap even back then, thanks to guys like Bendis). But I guess that was a long time ago now. There’s an entire parallel market of comics that already exists- but it’s blacklisted from the clique comic media, and due to a distribution monopoly, can’t get into stores. Comics doesn’t need a Pulp Revolution. That’s for us folks over in Fantasy & Science Fiction, who are trying to save and restore what made F&SF stories great. Comics needs ITS OWN revolution, however that manifests, whatever people want to call it, to save and restore what made comics great. Bring back actual superheroes, bring back romance and passion and humanity, bring back women who LOOK LIKE WOMEN. Bring back adventure, and vitality, and STORIES. Bring back all that was awesome, and all that has been lost. SJWs have RUINED the Marvel Universe and many legendary characters, all so they could pimp their politics on the public’s dime and the public’s time. Comics needs people who love comics, and hate what SJWs have done, to step up and fight back. Make new comics, make new stuff that is filled to the brim and overflowing with all the AWESOME stuff that comics should be—and once were—about. What is your opinion on the games industry? What is it about the tenor of press conferences that raises your eyebrow? As far as I am aware, all of this is nothing all that much worse than what has been going on for years. The anti GG crew and the cultural parasites may not have killed gamers as planned, but they have indeed been killing western games development (or helping it kill itself). Really, the only metric left to judge the industry by is the state of the Japanese side, and so far things are looking up over there. Nioh, NieR, Soulsbourne are doing well. A REAL Monster Hunter is coming to REAL consoles for the first time. Devil May Cry 5 has been rumored for YEARS and might actually be real. But still, the industry looks like its on the uptick to me. I’d be interested to know your thoughts on the matter. Diversity & Comics does not need to write the new comics. He can be a publisher and hire writers. Whether new blood or experienced writers who fell out with Marvel & DC or both is up to him.